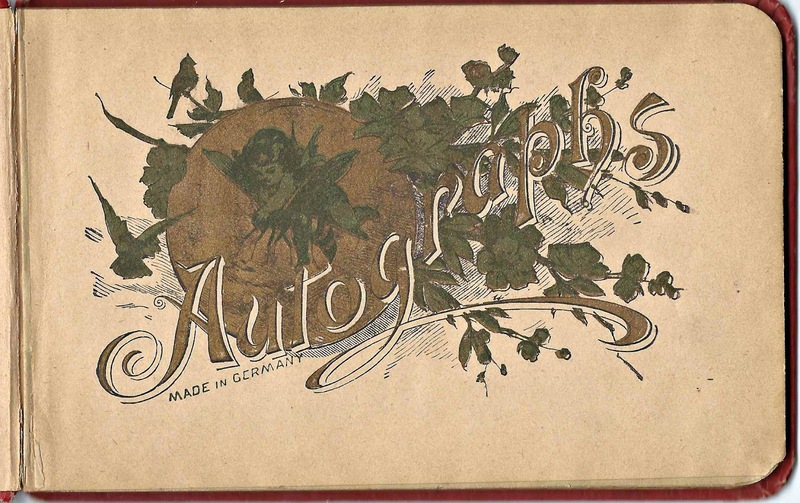 1890s/1900s autograph album that belonged to Ellen Louise Hughes of Castleton, Vermont. The album is approximately 7" x 4-1/2" and contains over 25 pages signed by Ellen herself, her grandmother, parents and friends. An alphabetical list of the signers appears at the end of this post. The album was presented by Ellen by her grandmother. Thismight have been her maternal grandmother, Sylvia Diana (Price) White, who was living with Ellen's family at the time of the 1900 Census of Castleton, Vermont. 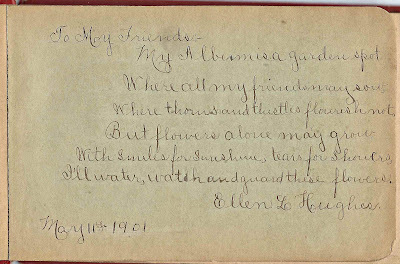 Ellen inscribed the next page to those who would be leaving sentiments in her album. Ellen Louise Hughes was born 29 September 1888 at Fair Haven, Vermont, the daughter of Henry Ellis Hughes and Sarah Lenita (White) Hughes, who were born at Fair Haven, Vermont, and in New York respectively. 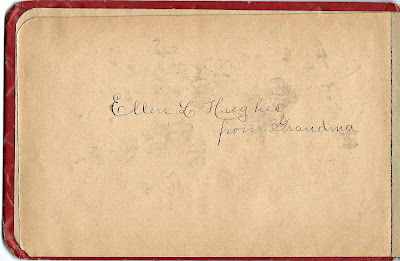 Ellen's parents signed facing pages in her album. Her mother's page contained only the word Mamma. 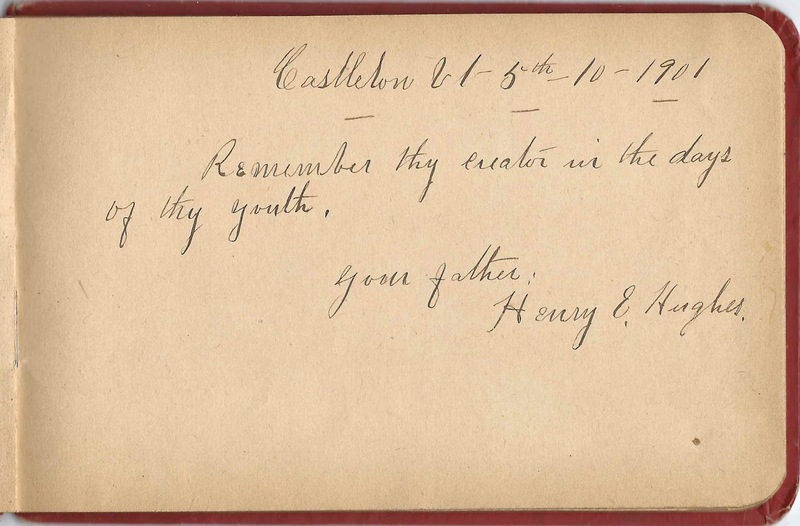 Ellen's father, Henry E. Hughes, signed at Castleton, Vermont, on 5 October 1901. Some of the signers in Ellen's album indicated they were fellow students at Castleton Normal School at Castleton, Vermont. So it fits that in the 1910 Census of Castleton, Vermont, Ellen's occupation is listed as teacher. On 3 July 1913 at Castleton, Vermont, Ellen married Roscoe Charles Hunter, son of Thomas and Maria Hunter. They farmed at Castleton. If they had children, I didn't find a reference to them. 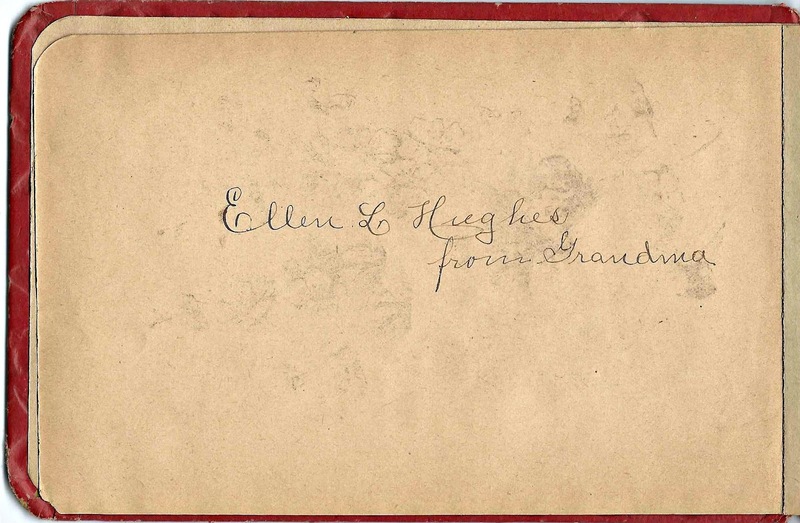 "Ellen L. Hughes from Grandma". 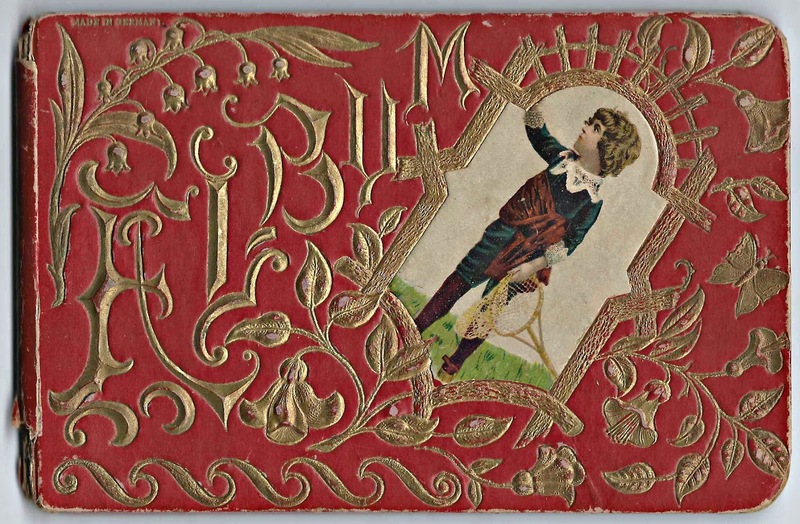 This was a present to Ellen Louise Hughes of Castleton, Vermont, from her grandmother. This might have been her maternal grandmother, Sylvia Diana (Price) White, who was living with Ellen's family at the time of the 1900 Census of Castleton, Vermont. 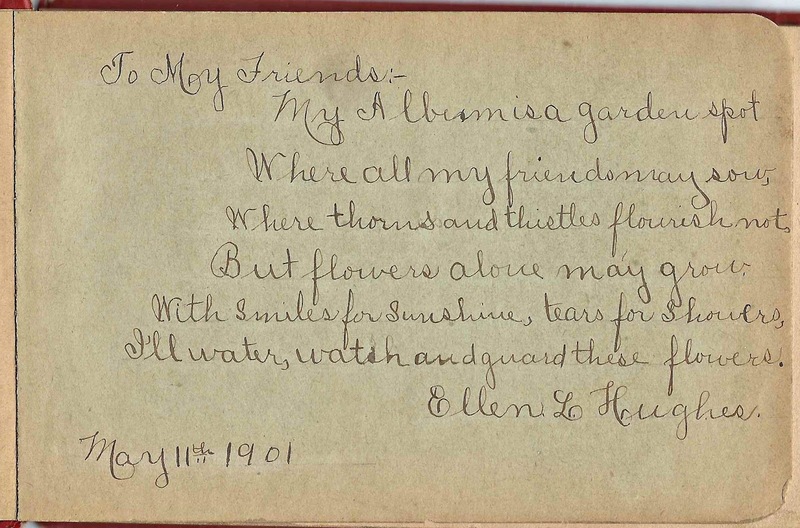 Page inscribed by Ellen L. Hughes on 11 May 1901 to the future signers in her album. Mamma. Presumably this was signed by Ellen's mother, Sarah Lenita (White) Hughes. 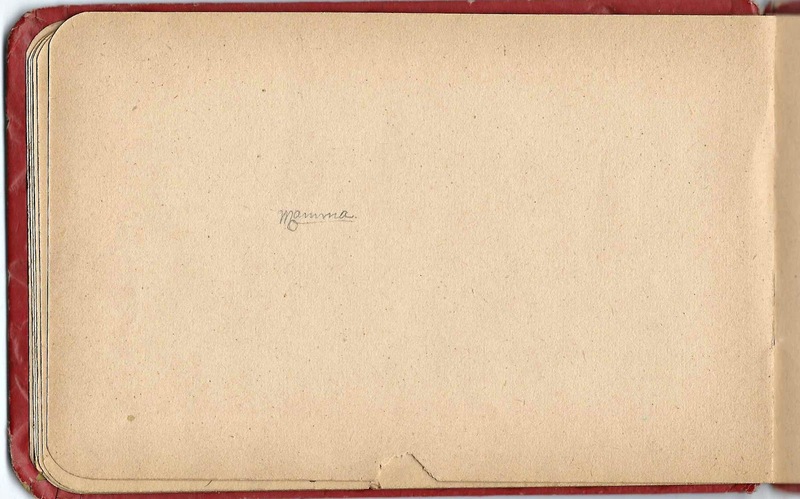 Ellen's father signed the facing page. 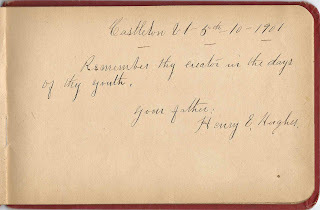 Henry E. Hughes, signed at Castleton, Vermont, on 5 October 1901; Ellen's father. 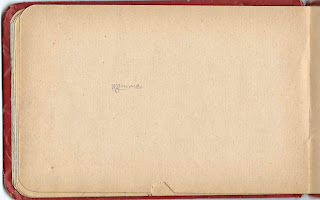 The facing page was signed by "Mamma"
Ada M. Roberts of Hortonville, Vermont, C.N.S., possibly Castleton Normal School. "Man's love is like Scottish snuff; Take one pinch and that's enough." Julia A. Stevenson of Rutland, Vermont, signed on 2 October 1894. 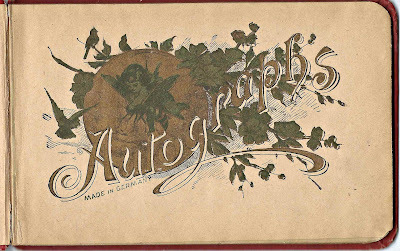 Another page that was signed earlier than Ellen's own inscription page.